Outgoing postcard US-3128753 to Czech Republic was an original 1956 vintage postcard showing Rainier III, Prince of Monaco, and his wife American actress Miss Grace Kelly, Oscar winner for Best Actress. 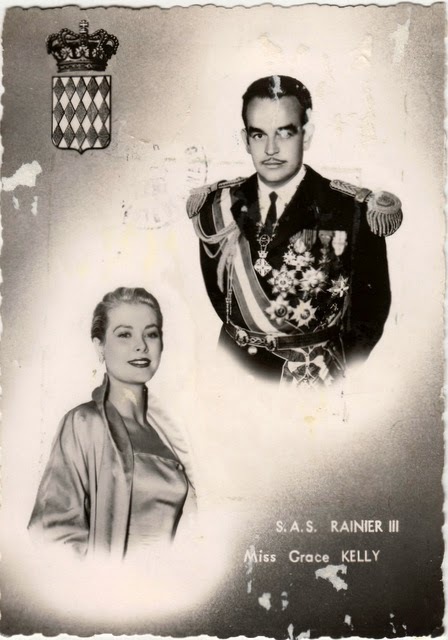 Rainier III (May 31, 1923 – April 6, 2005) ruled Monaco for almost 56 years, which made him one of the longest ruling monarchs of the 20th century. He was credited for reforming the Monaco's constitution and diversifying the Monaco's economy from traditional gambling industry. When Rainier took the throne in 1949, Gambling accounted for more than 95% of the nation's annual revenue; today it has only 3% share.